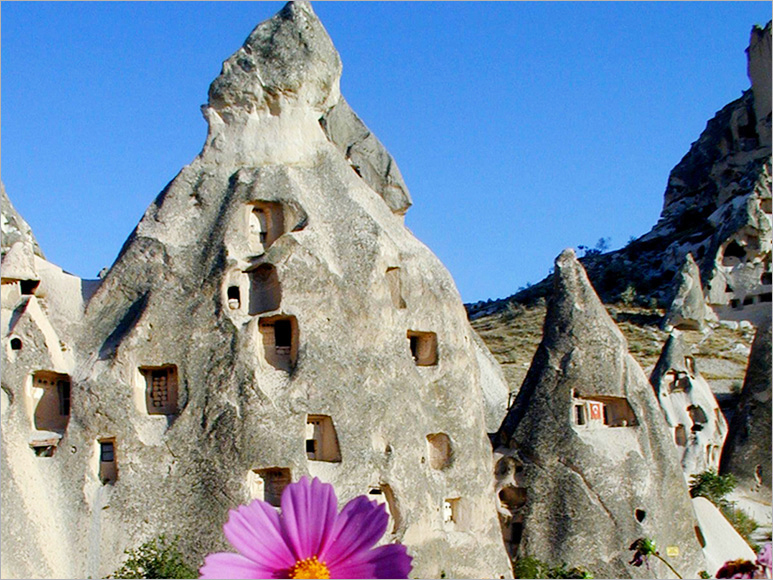 Nevsehir is a real outdoor museum with its natural beauty, valleys, underground cities and churches carved into the rocks. 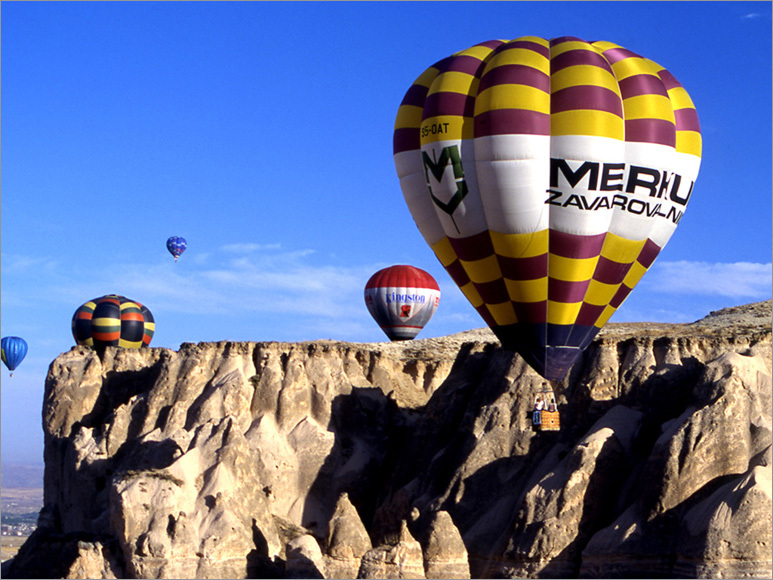 Located in the very Central Anatolia, Nevsehir can be reached through land lanes and sea lanes. 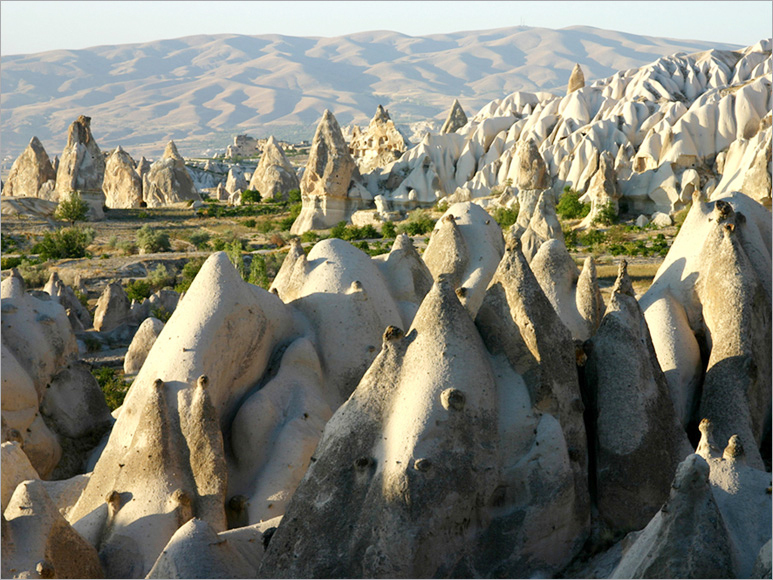 Nevsehir is situated on a quite large plateau created by deep layers of volcanic ash settled into easily carved tufa that came out of such ancient volcanoes as Erciyes, Melendiz and Hasan Mountains in Capadoccia with a completely fascinating atmosphere. 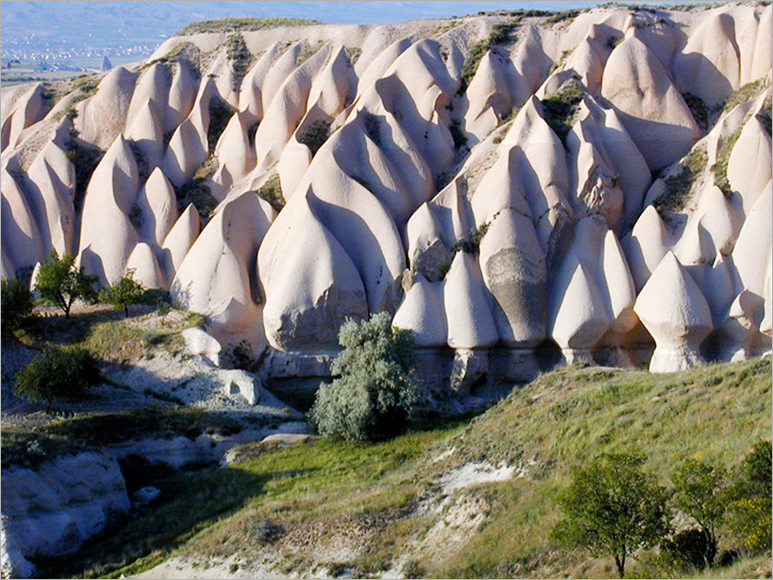 The River Kizilirmak hollows this plateau deeply in east-west direction. 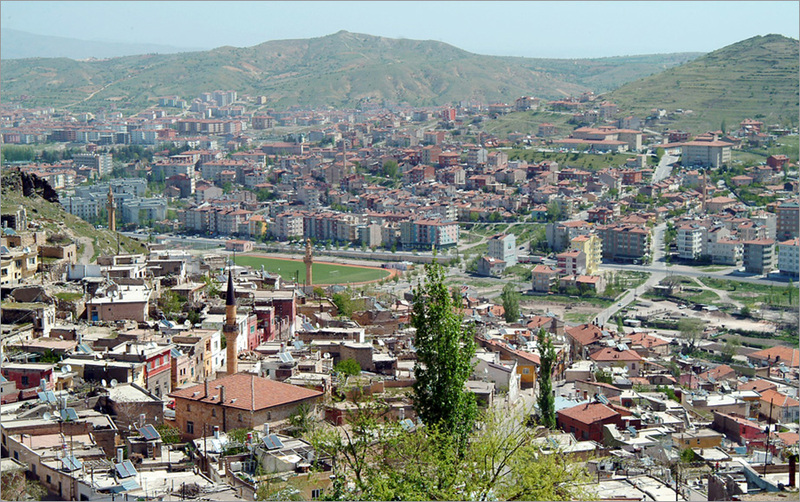 The town itself is located on the western side of Kizilirmak Plateau, which is formed of high plains. Settlements dating back to years 6500- 3000 B.C. 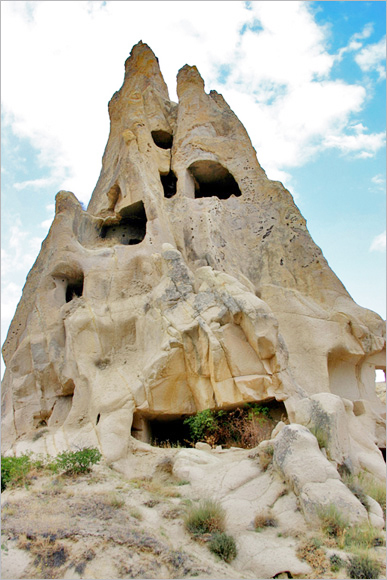 can be seen in Civelek Cave located in Gulsehir Town, which was once named Nysa and Muskara, affiliated to Nevsehir province. Archeological finds refer to the Old Bronze Age (B.C. 3000- 2000) and Assyrian Merchant Colonies’ Age (B.C. 2000- 1750). ‘Capadoccia Tablets’ and cylindrical seals have implications regarding the developed trade traffic established by the Ancient Assyria State in Mesopotamia. Following the mentioned period which had effects on Anatolia as well, the town was reigned by the Hittites between the years 1750- 1200 B.C, invaded by migrant groups in the 12th century B.C, and by Cimmerians and Scythians in the 7th century B.C. Later again, Nevehir was reigned by Assyrians between 680- 610 B.C, by Meds between 610- 550 B.C, and by Persian Katpatuka (Capadoccia) State in 547 B.C. Held by the Independent Capadoccia Emperor and Selevcos in 332 B.C, by Romans between the years 17 - 395, by Byzantine Emperor between 397- 1071, by Sassanids for a short period, then by Anatolian Seljuks between the years 1071- 1299 and Karamanogullari in 1402, Nevsehir was lastly taken over by Ottomans in 1466. Many buildings such as bridge, karwansarai, public bath, madrasah and mosque were built during the Tulip Period in Nevsehir, where the worldwide known thinker Haci Bektas Veli and Ottoman Vizier Damat Ibrahim Pahsa lived once. 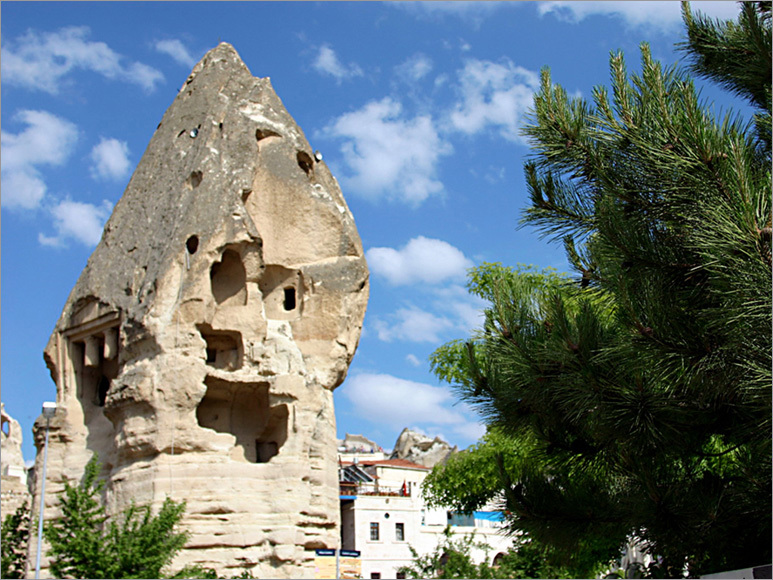 Damat Ibrahim Pahsa renamed the town as Nevsehir (meaning “New Town”) in 1725. 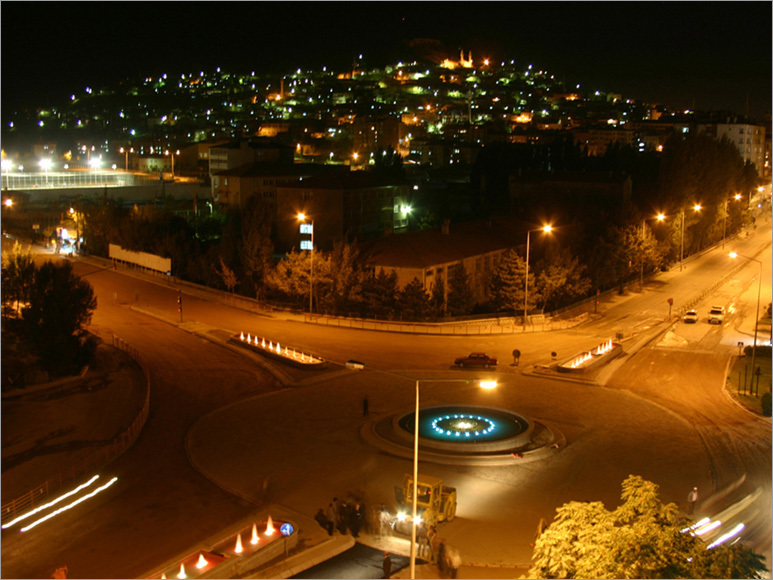 While it was a county affiliated to Nigde province following the proclamation of the republic, Nevsehir was declared a province in 1954. 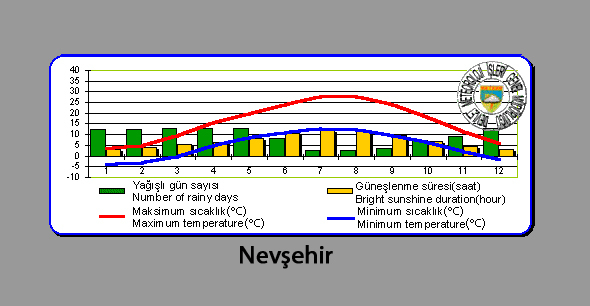 Counties affiliated to Nevsehir are as follows: Acıgol; Avanos known for pottery making; Derinkuyu with underground towns; Gulsehir; Hacibektas, the town of famous Islamic thinker Haci Bektas Veli (13th century); Kozakli well-known for its thermal sources; and Urgup, one of the most important centers in Capadoccia. 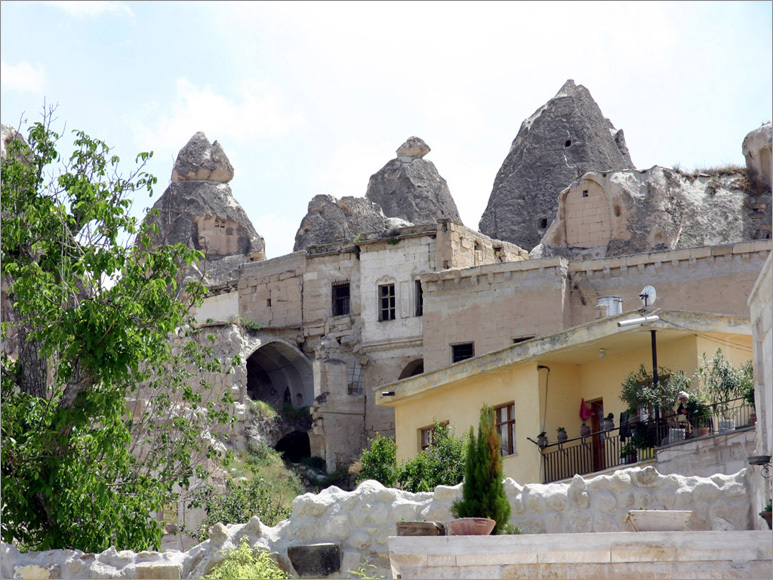 Surrounding of Nevsehir is one of the biggest outdoor museums with ruins, underground cities and churches open for visitors. Soup Kitchen and Primary School in Damat Ibrahim Pahsa Building Complex were restored and turned into a museum in 1967. There are 15,342 pieces of archeological and ethnographic work pieces in the museum that was taken to its premise in Kultur Sitesi (Culture Complex) in 1987. Haci Bektas Veli, who lived in Horasan during his childhood and adolescence, was a famous Sufi and a Muslim thinker. He founded a center in Hacibektas on Islamic belief and teachings clinging to traditions and customs. Many students were taught in his teaching center (that is Haci Bektas Veli Tekke and Building Complex adjacent to the Mosque). Also known as the spiritual guide of the Janissary Army, Haci Bektas Veli supported the Turkish-Islam political union in Anatolia in his lifetime. Among his well-known sayings can be mentioned: “Do not hurt anyone even if you were hurt.”, “Success achieved only through patience.”, “Look for anything in yourself!”, “Let women be educated!”, “Blame no nation or human being!” . Kizilca Halvet built by Haci Bektas Veli in the 14th century (a place for trial and suffering) was followed by some other buildings. Mentioned tekke in Hacibektas county was opened as a museum in 1964 after being improved in the 19th century. There are precious ethnographic finds such as Suluca- Karahoyuk finds; Old Bronze, Assyrian Merchant Colonies’, Hittites, Frig, Roman, Byzantine works and other specific objects related to the era and teachings of Haci Bektas Veli in the museum with two stores of works, a laboratory and a library. The museum was opened in 1971. Samples of fossils found in Urgup and surrounding, pieces of works indicating Prehistoric, Old Bronze Age, Hittite, Frigian, Persian, Helenistic, Roman, Byzantine and Ottoman times are exhibited. Also there are ethnographic pieces of clothes, objects and weapons peculiar to the region as well. High plateau s, plain fields, high hills, river and stream valleys enriched with alluvium, valleys with steep slopes and high plain areas constitute The National Park in Hasan and Erciyes Mountains volcanic area. Being uneven and located far from the main arteries, the Park has always been a place for those who want to hide from the others and retreat. Therefore, residents in the park have been kept away from destructive effects of wars all the time. 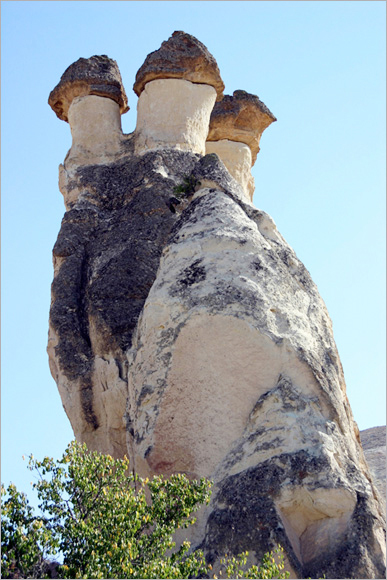 Fairy chimneys with weird and interesting outlook that were formed of volvcanic tufa and Byzantine architecture in the churches constitute natural and artistic beauty of the National Park. 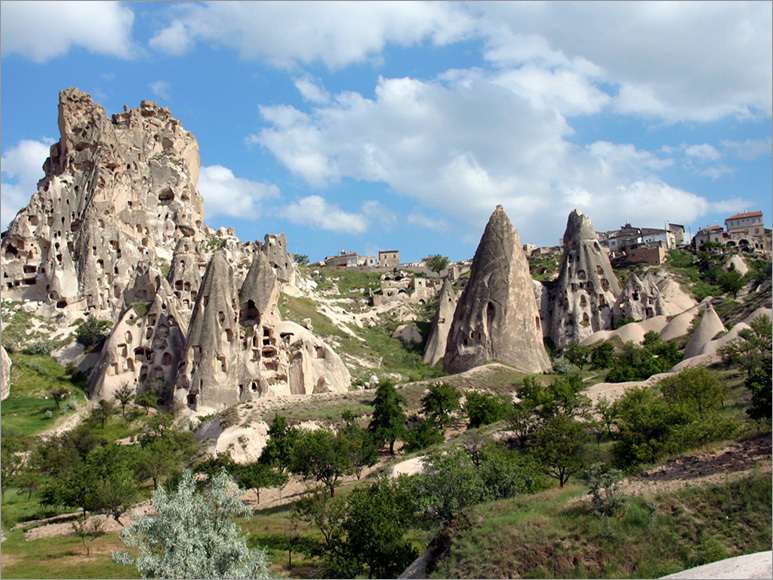 The rock settlements located 2 km away from Goreme, which is surrounded by valleys in the middle of Nevsehir-Urgup-Avanos triangle located 10 km far from Nevsehir, witnessed cloister from the 4th to the 13th century. 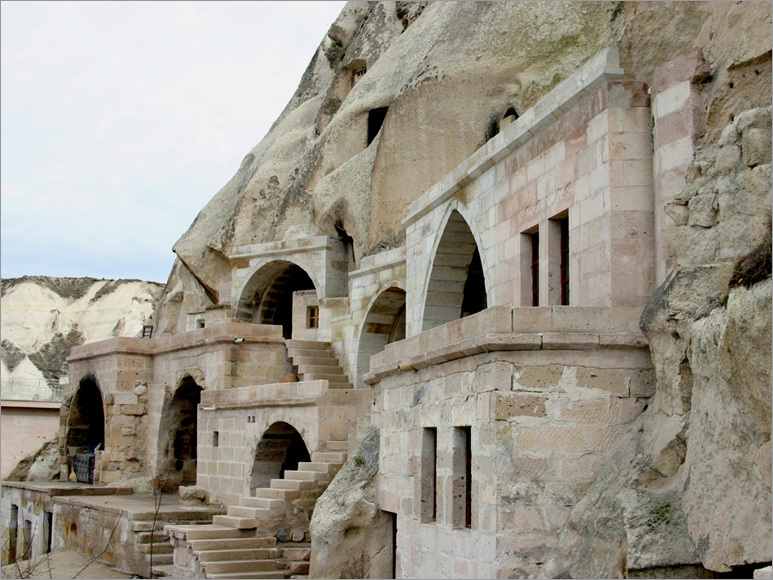 There are churches, chapels, mass dining halls,and living units inside the rock blocks in Outdoor Goreme Museum, which is regarded as the place where monastic education system started. Soganli, Ihlara, Aciksaray are other places where the system was applied in following times. Churches in the Museum: Monastery of Nuns and Monks; a dining hall, kitchen and rooms are available on the first floor of the monastery with 6-7 floors carved inside the rocks. The second floor has a chapel; and there is a cross-domed church with three abscissa on the third floor which is led by a tunnel. Since passages between the floors were blocked by erosion, only few of the rooms at the entrance can be seen in the Monastery of Monks today. 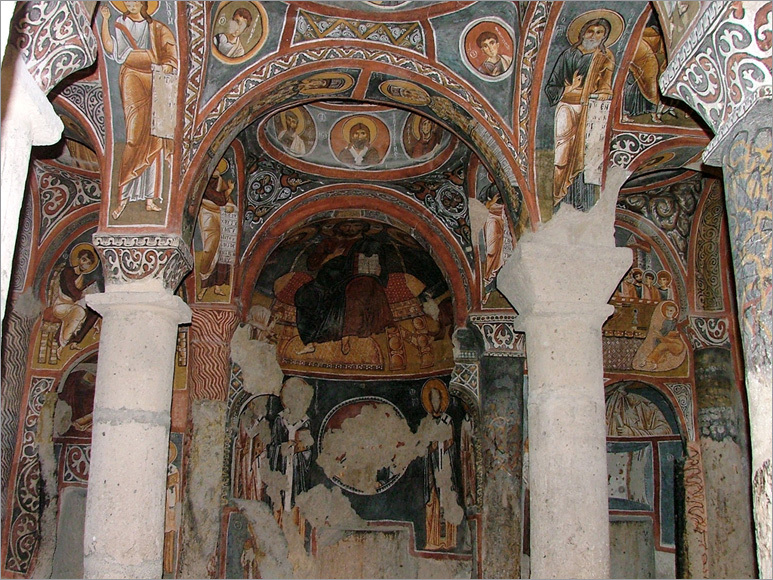 Frescos depicting Jesus, the Virgin Mary and saints can be observed in the chapel dating back to the 11th century. Also there are pits for graves in the narthex which is separated by columns. The nave of the chapel has semi-circular vault, rectangular plan scheme and three abscissas. The church which has nine domes, four columns, closed Greek cross plan scheme and three abscissa dates back to second half of the 11th century. The church was named after the apple orchards were grown around. 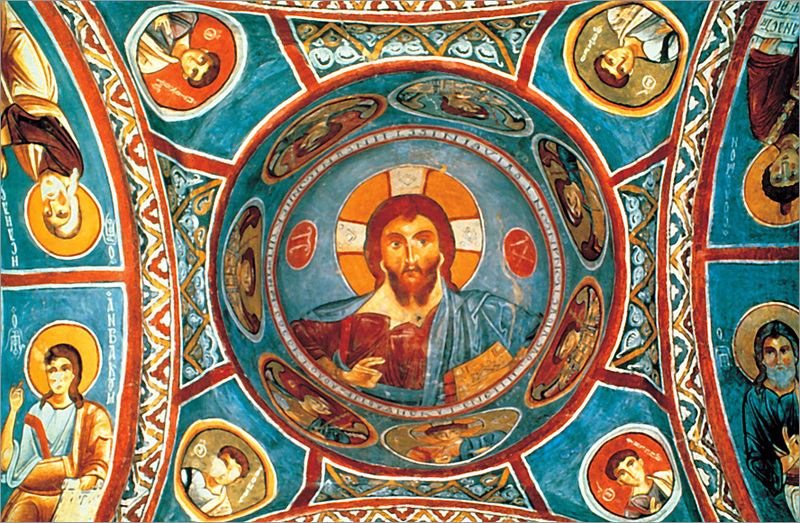 The frescos composed of colors such as blue, red, brown, yellow and white depict various squares from Christ’s life. 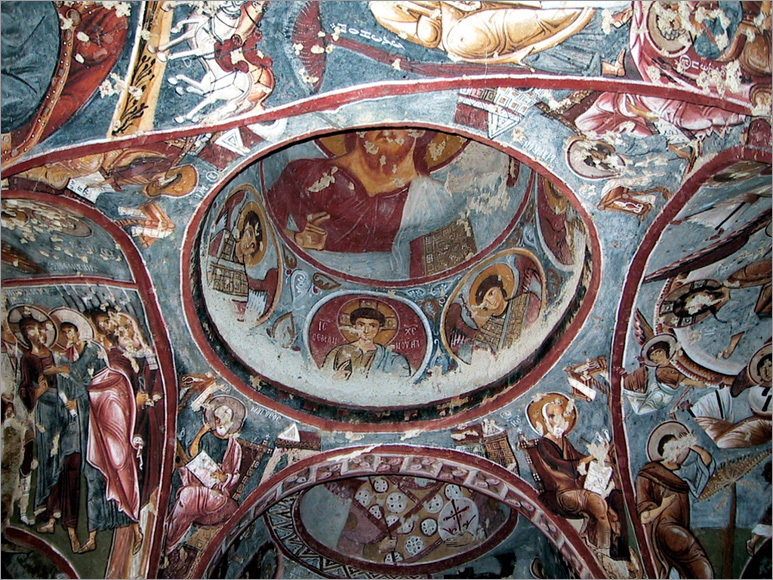 Under these frescos are some geometrical motives belonging to the iconoclastic period seen. Also people can see depictions of saints and prophets on the columns and heads of columns. This church is located behind the block of rocks where the Elmali Church is situated. It dates back to the second half of the 11th century. The building is designed on a cross plan scheme with semi-circular vault, and centered dome. 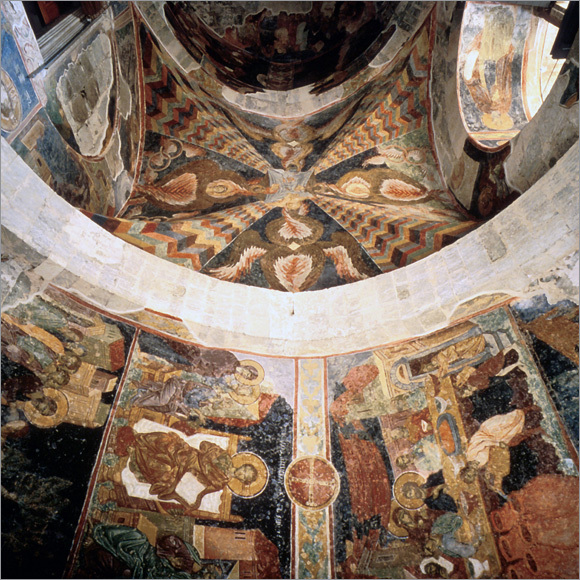 As for the depictions on the walls and dome, there can be seen mythological creatures and military symbols and geometrical ornaments in red color. On the dome, Saint Barbara is painted on one of the cross-planned chapel columns beside the figure representing Pantocrator Jesus (Master of the Earth). Red is the dominant color in superficial figures including black color contours in specific parts. The church dating back to the 11th century has transverse rectangular plan scheme and semi-circular vault. Abscissa of the incomplete church has been carved into the tall left side wall. 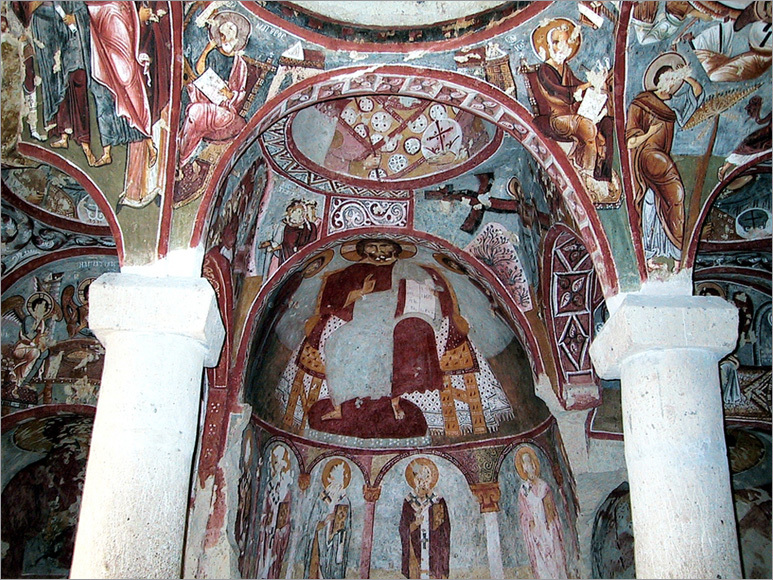 In the south of the church, whose frescos depict Saint Onuphrius, is another place with an even ceiling. Graves are located in this place. Three doors adjacent to each other between the Yilanli and Karanlik Churches lead to the Pantry/ Kitchen/ Mass Dining Hall. There are pits for storing food; a tandoor (an oven consisting of a clay-lined pit or a large earthen jar buried in) carved into the rock; and a large hall with dining tables and chairs of stone for 40- 50 people in the pantry, kitchen and dining hall; respectively. The church was named “Karanlik” (meaning dark) since it has no illumination except for the light through one small window in it. It has the frescos that revived to the best extent so far. This church, too, was carved in rocks in the late 11th century. It has four columns, Greek plan scheme covered by cross vaults. 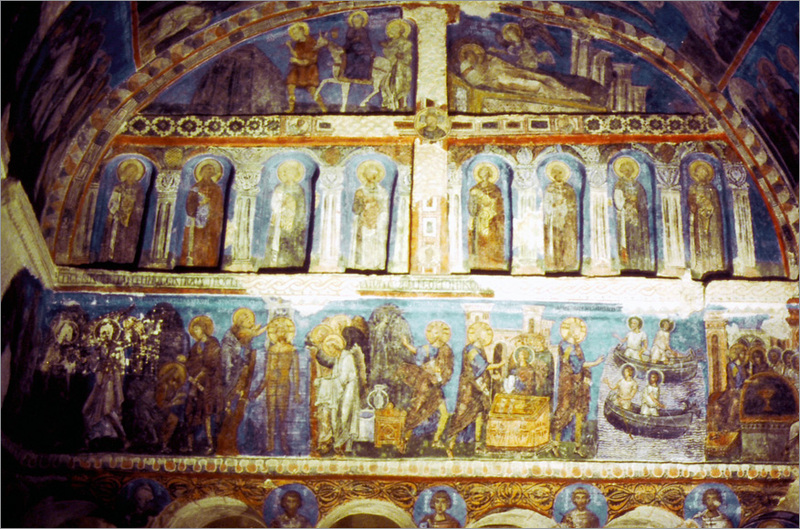 Frescos represent various scenes from the Bible and Testament. The chapel dating back to the 11th century has narthex and naos with free cross plan scheme and a centered dome. On the ground of the narthex do nine graves lie; on the walls does a grave with two niches (arcosolium) stand. Figured depictions and geometrcial ornamentation are seen on frescos on the naos and on the pendentives, respectively. The builging dating back to the late 12th and early 13th centuries has two columns cross vaults, four domes and three Abscissas. 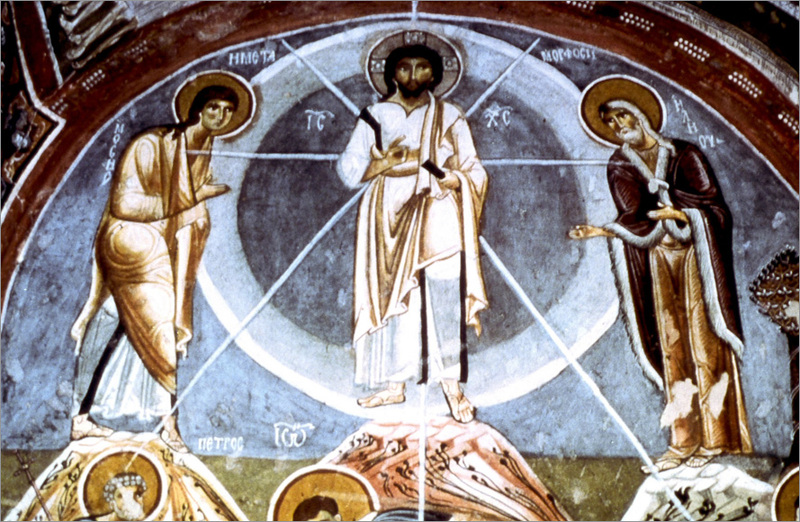 Frescos depict not only scenes from Jesus’ life but also those from the Testament. 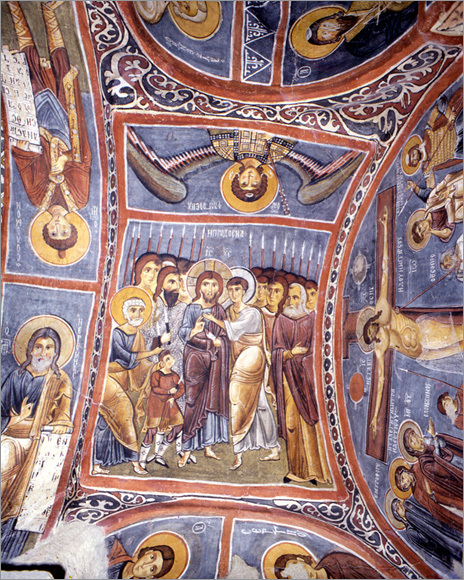 The church was named as Carikli (meaning rawhide sandals) after the footprints below the frescos depicting resurrection of Christ. The oldest rock church known by date, the church is composed of four sections: old church with single nave, new church, adjacent chapel and church below the old church. An established primitive style can be predominantly seen in the scenes in the form of friezes having the shape of horseshoe on the arches. The old church dating back to the 10th century has one single nave, semi-circular vault and is positioned at the entrance of the new church. 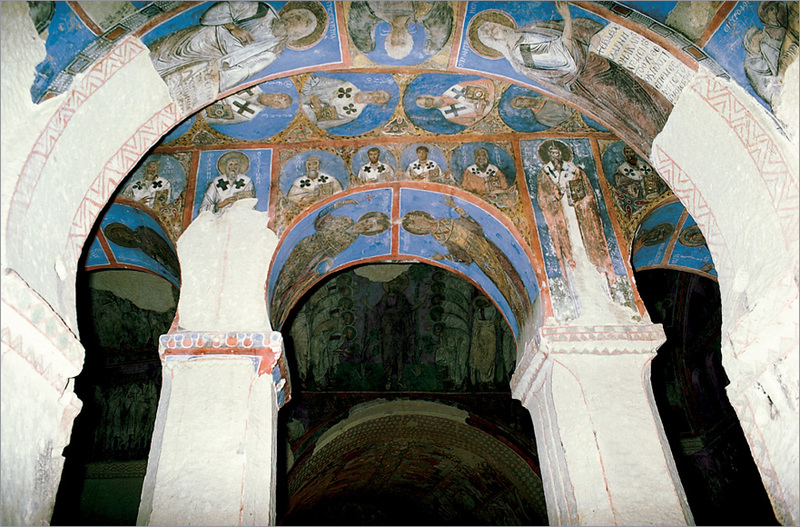 On the vault facade and higher walls of the new church with longitudinal rectangular plan scheme and simple semi-circular vault, there are depictions of Jesus’ life and Saints in blue and red colors in a chronological order. The building, positioned between the Tokali and the Virgin Mary Churches, dating back to the early 10th century exhibits various events from the Bible. Deisis, Journey to Beytullahim, labor, Jesus on the cross, death of the Virgin Mary and pictures of some saints are depicted in the church which is located at the hill in the South of Kiliclar Church, approximately 250 m far from the outdoor museum. Kiliclar Church, which is positioned in Kiliclar Valley, dates back to the late 9th or early 10th century. The building designed on a cross plan scheme has a centered dome, semi-circular vaults, and three Abscissa . Frescos depict issues such as appearance of prophets, good news, visit, Joseph’s blaming the Virgin Mary, labor, Joseph’s dream, escape to Egypt, baptism, treating the blind man, washing feet, betray, etc. 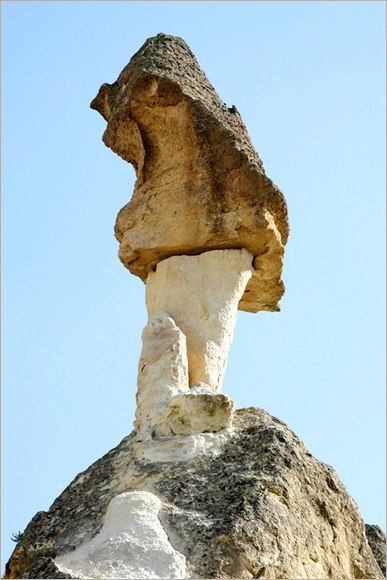 It is located in El-Nazar Valley 800 m away from the road to Goreme Museum. It dates back to the late 10th century. Carved in fairy chimney, the building has T-plan scheme and semi-circular vault columns on the cross. Frescos chronologically depict the Biblical events. Sakli Church around El Nazar Church has transverse rectangular plan scheme. Main body of the building is divided by two columns and three arches. The even ceiling is ornamented with crosses and geometrical motives. Drawings are painted directly on the rock instead of on the plaster coat. As for the frescos on the walls, Jesus’ life is represented. 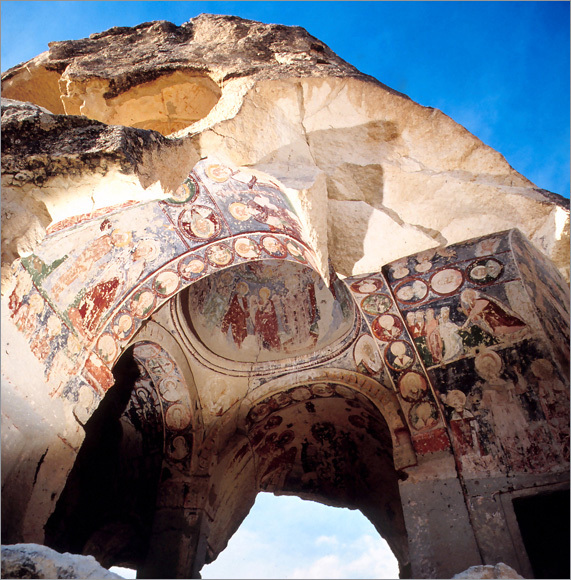 Cavusin Church 2,5 km away from Goreme (964- 965) has one single nave and semi-circular vault. Narthex of the building with three Abscissas is destroyed. Similarly, frescos depict Biblical scenes and events. The church is built on a steep slope at the begining of Gulludere Valley located approximately 2 km far from Cavusin Village. The building has rectangular plan scheme, even ceiling and one single wide Abscissa . The building was built in the 6 - 7th century and completed in the 9 - 10th century with Abscissa which has a medal on which Bible authors on both sides of Jesus in the throne are depicted. On the ceiling is a cross depicted inside a circle; on the sides are motives of palm tree and garland painted. The church with basilical plan scheme has grave pits carved inside large rectangular rooms, baptism room, priest’s thrown and walls. It is possible to see the best ornamentations of rock relieves on the building dating back to the 6. - 7th century. 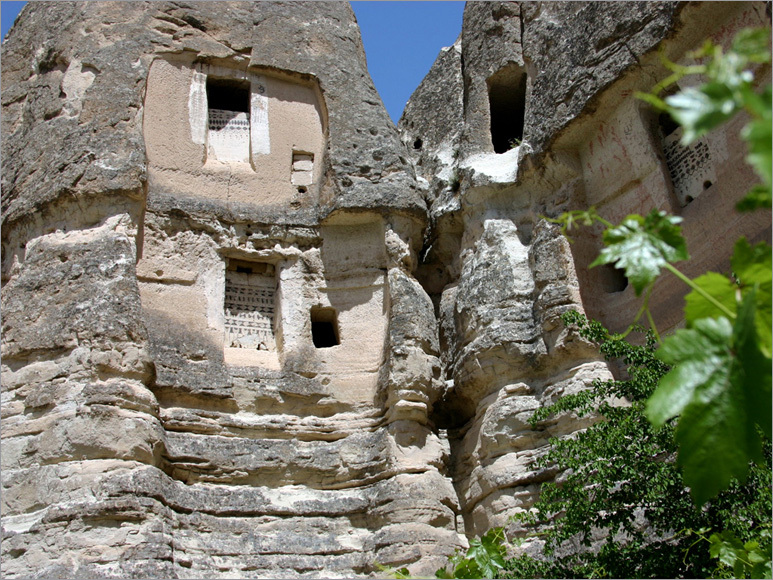 Following churches can be mentioned: Tatlarin Church (Acıgol), located on the slope of the hill where Tatlarin underground city is founded; Tagar Church (St.Theodora Church), dating back to the 11th and 13th centuries in Yesiloz Village affiliated to Urgup; Kirk Sehitler Church in Sahinefendi Village affiliated to Urgup county; Pancarlik Church located in Pancarlik Valley on the right side of Urgup - Mustafapasa Road (the 11th century); Uzumlu Church, considered to date back to the 8th and 9th centuries located in Kizilcukur Valley in Ortahisar; Sarıca Church, Cambazli Church, Tavsanli Church, Balkan Deresi Church, Hallac Dere Monastery in Ortahisar; Vaftizci Yahya Church in Cavusin; two-storeyed Saint Jean Church (13th century) carved in a fairy chimney in Aciksaray; Orthodox Church built between the years of 1858- 1860 in Derinkuyu. The Greek Houses made of stone in Mustafapasha (Sinasos) in the south of Urgup (6 km) are quite interesting in terms of stone embroidery. Aios Vasilios Church, Sinasos Church, Alakara Church, Aios Nichole Monastery, Konstantin- Helena Church and St. Basil Chapel (726- 843) can be mentioned as big churches and monasteries in the region. 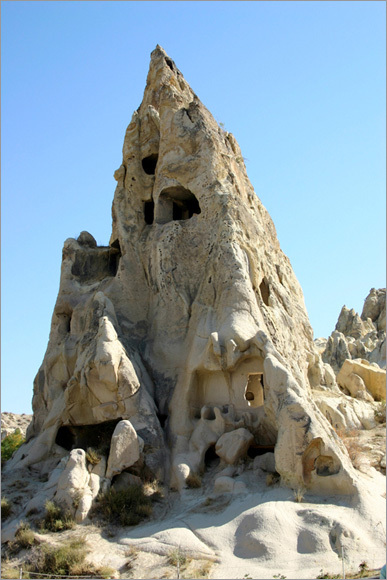 Also there are some churches carved in rocks in Gomede Valley in the west of Mustafapasha. 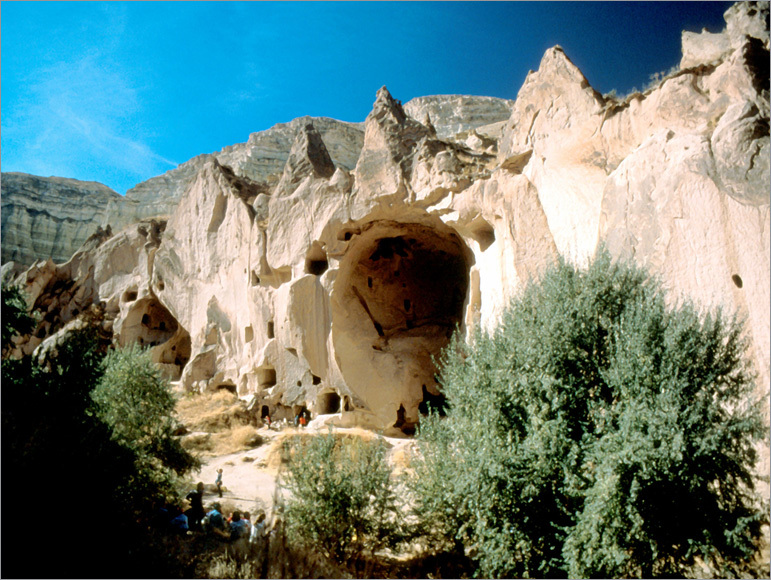 Located in the east of Gulsehir (4 km), the cave is one of the oldest (B.C. 6500- 3000) settlements. It is possible to reach the cave through a downside gallery of 14 meters located on Gurlek Tepe. Main body of the calcareous cave has width of 22 x 11 m. Stalactites formed of calsit cyrstal in the length of 5- 15 cm hang down from the ceilings. Being under protection; the cave with potters, tools of stone and bone, cups and textile tools in it referring to the Calcolithic Period is closed to visitors. Tough rocks were aparted by floods flowing down from the steep valleys. Then, the ground under tufa was eroded by winds. 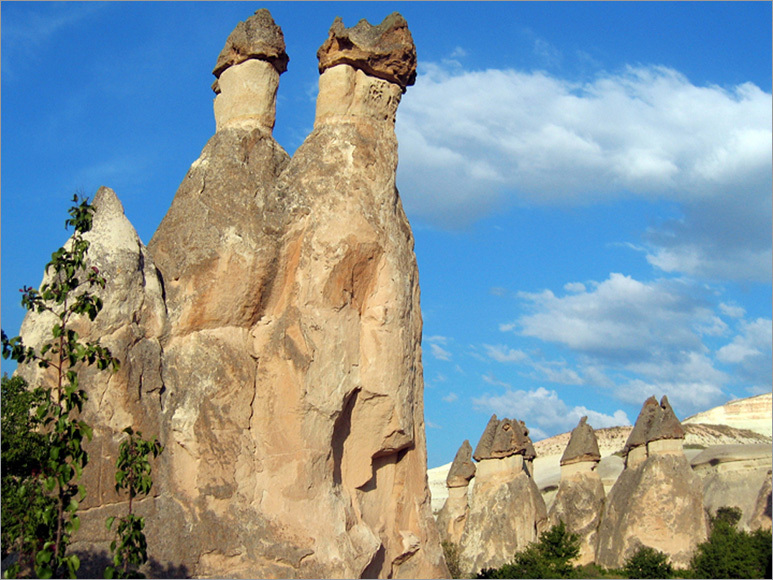 As a result, some weird-looking and interesting formations came into being called “fairy chimneys”. The rocks at the bottom were carved deeply while the higher parts remained untouched under the cap. 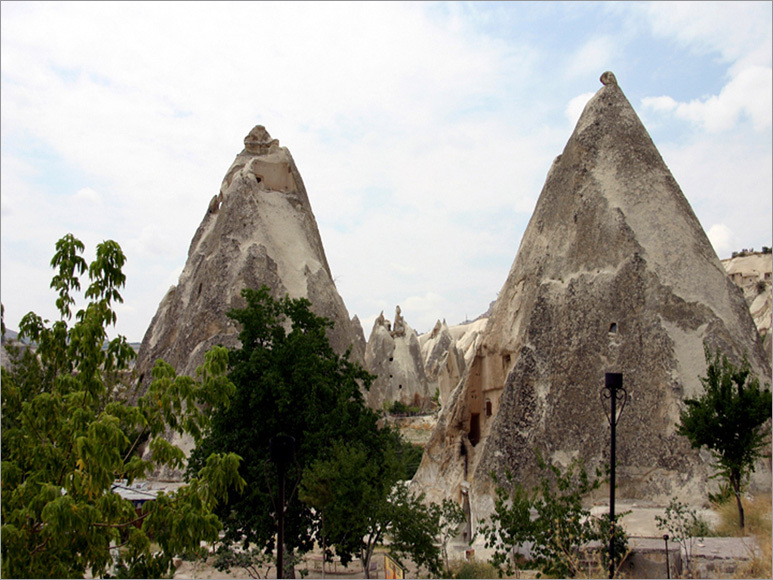 In this way, formations with conical shape were created. 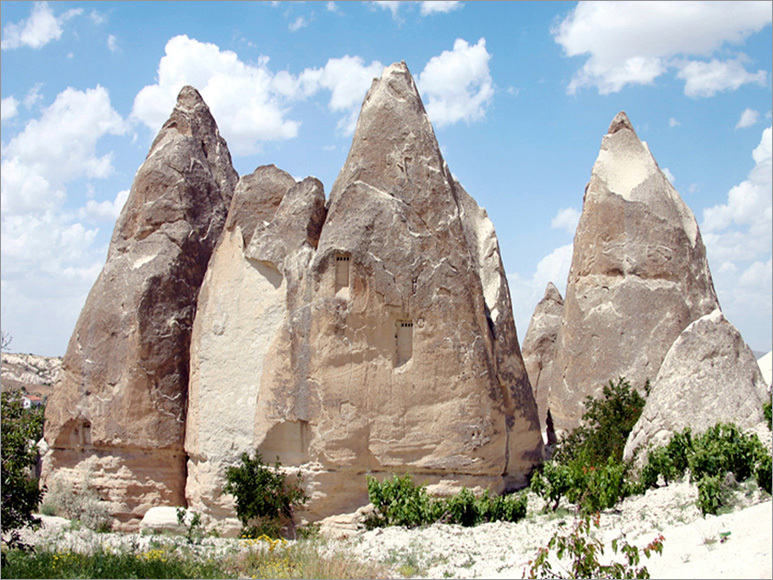 Fairy chimneys are scattered mostly around the valleys in Urgup – Uchisar - Avanos triangle; the face between Urgup – Sahinefendi; surrounding of Cat Town (Nevsehir); Soganli Valley (Kayseri) and Selimiye Village (Aksaray). 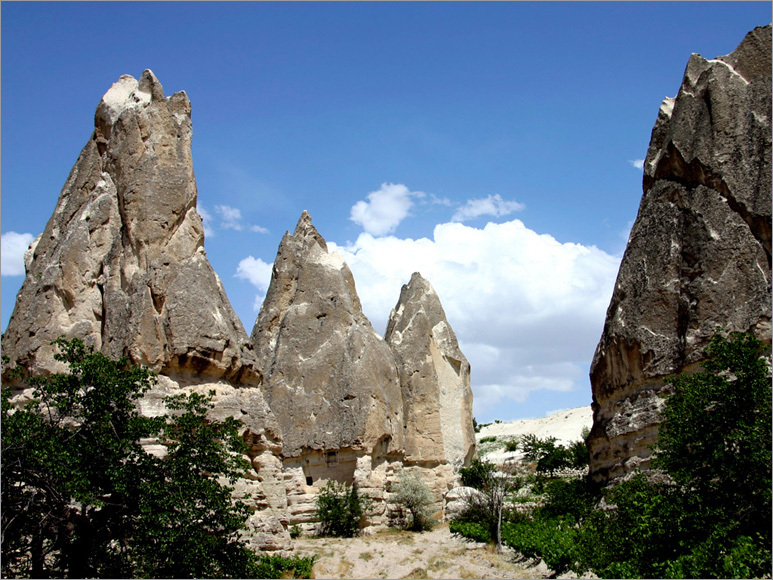 Fairy chimneys formed by erosion in Capadoccia have various shapes: capped, conical, fungoid, columnlike and pekaed. 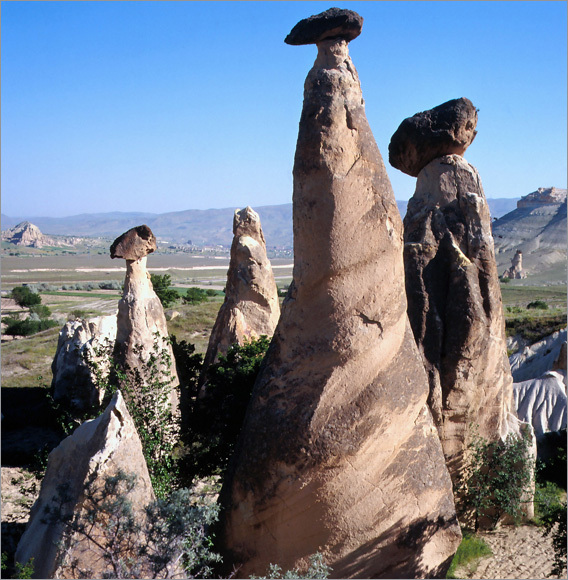 Fairy chimneys in Urgup have conical structure formed of tufa and more endurable rocks at the top. Endurance lengths of chimneys depend on the endurance of the rock at the top (cap). 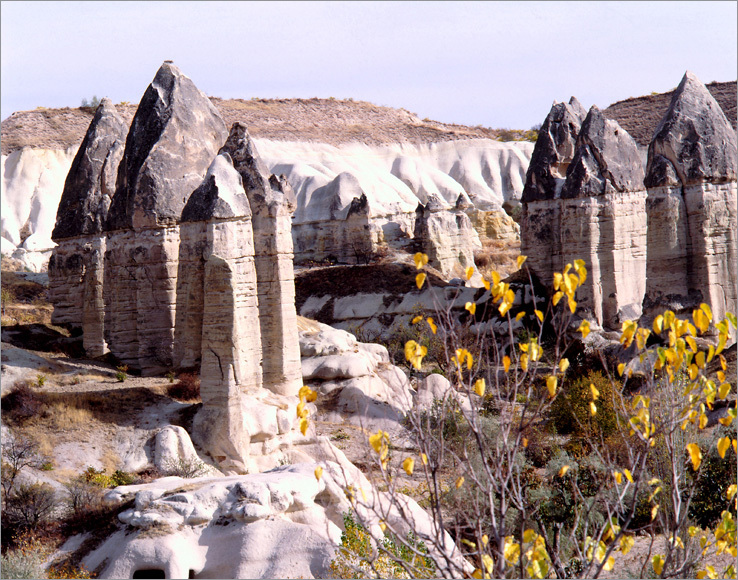 Unprecedented fungoid chimneys with carvings on them expanded on a land of approximately 1 square kilometer can be seen in Aciksaray. 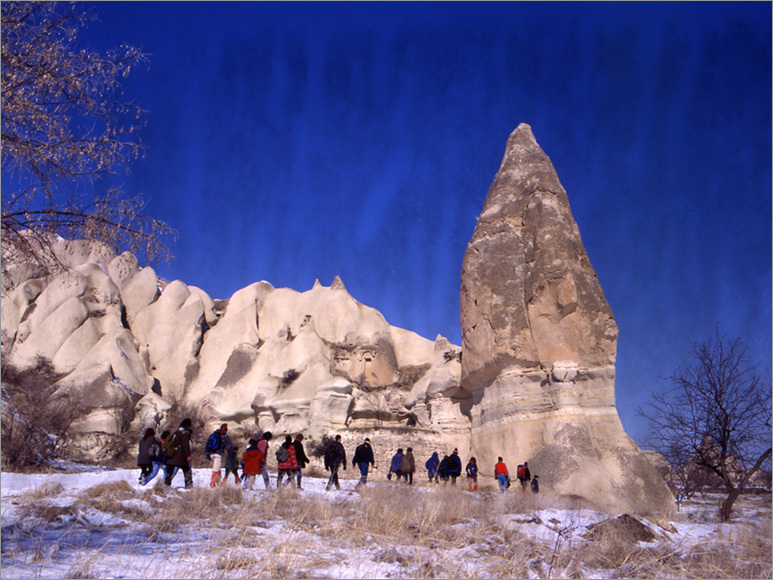 Some of the fairy chimneys in east, west and north Uchisar were carved for use as graves during Roman times. Dervent Valley is also called Pembe Valley (meaning pink) due to the pink color chimneys. 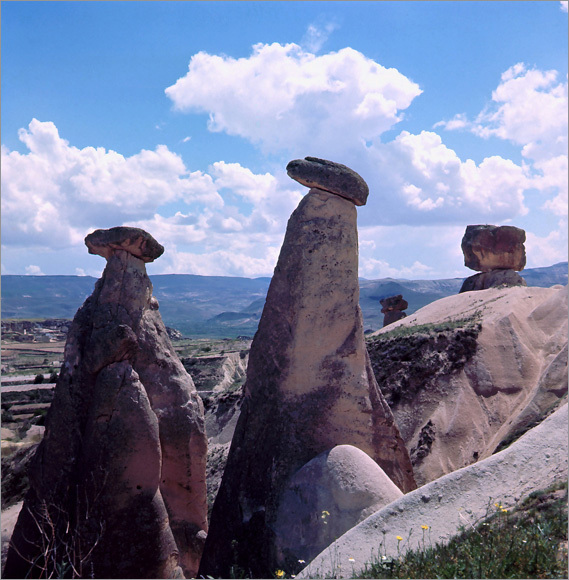 Red fairy chimneys are scattered around in Kizilcukur Valley. 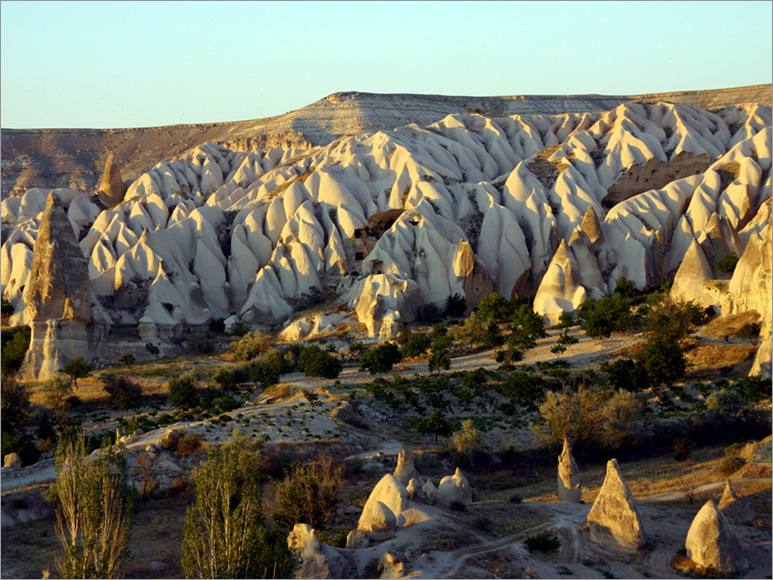 The Valley, interesting for its geological formation, exhibits a natural red view during sunset. Besides, various folds formed by rain on the valley’s slopes present a pleasant scene. 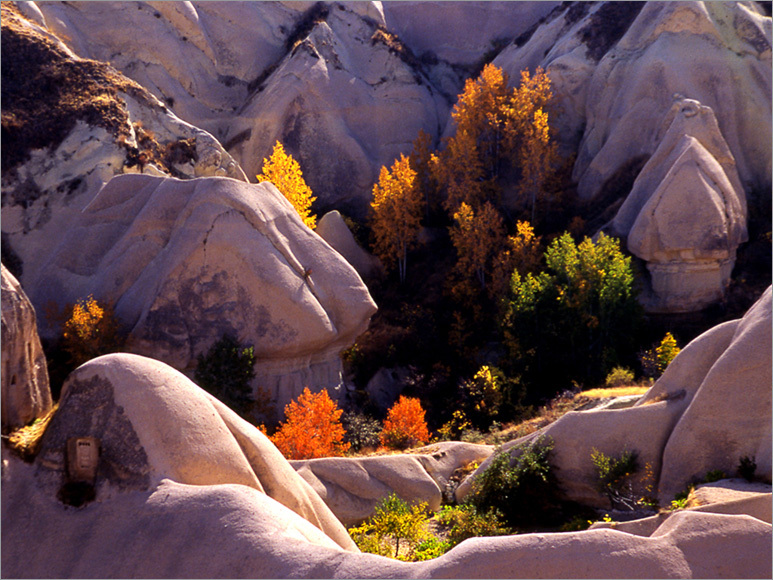 Many dark and light tones of colors ranging from white, yellow, gray to black can be seen in the valleys. White and yellow rocks were formed of tufa, tough and dark color rocks were formed of lava. 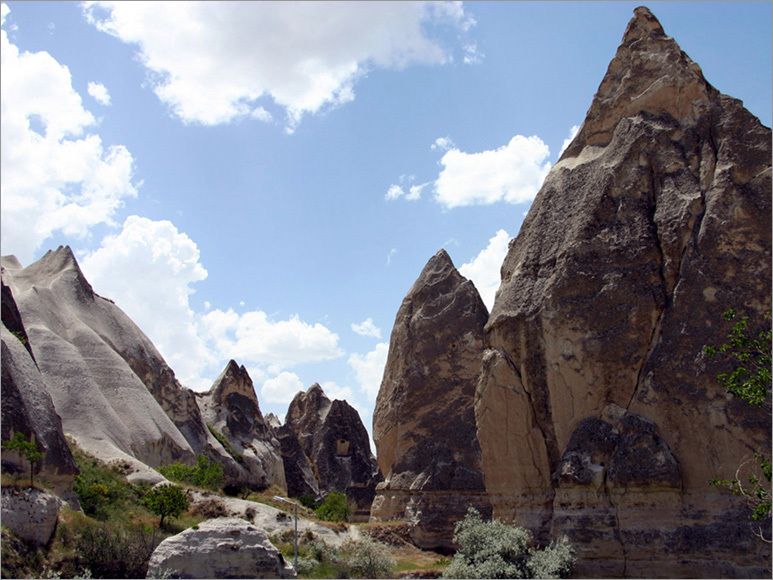 These formations can be seen in Uchisar, Cavusin- Gulludere, Goreme - Meskendir, Ortahisar- Kizilcukur and Pancarli. Those watching these sites during sunset witness an extraordinarily great view. Founded on steep slopes consisting of three valleys, Zelve is located 5 km far from Avanos. 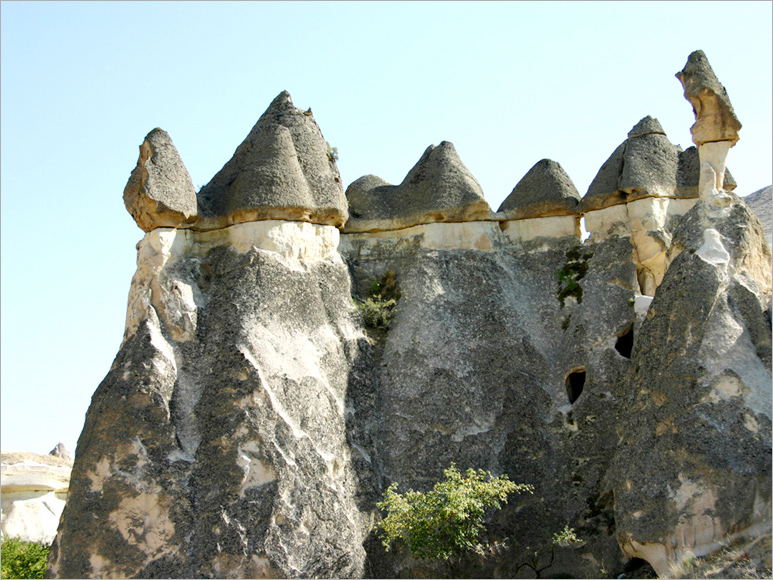 Zelve, with frequent occurences of various fairy chimneys, has become one of the settlement and religious centers for Chrisitians between the 9 – 13th centuries. Direkli Church, located at the bottom of the slopes, is a residue from the first monastic life. The biggest churches in Zelve are Uzumlu Church, Balikli Church, Hacli Church and Geyikli Church. 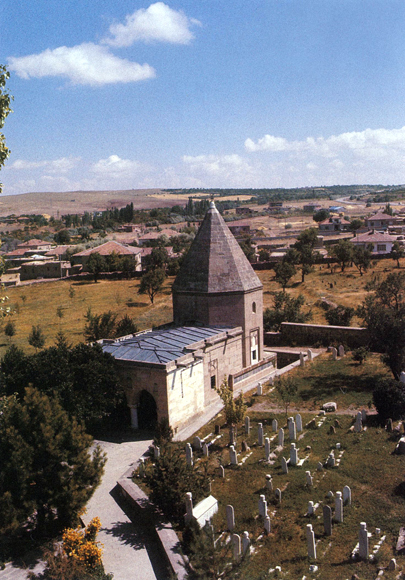 Balikli and Uzumlu Churchs are located in the east of a monastery courtyard. There are depictions exhibiting the Virgin Mary with Jesus in her arms at the entrance gate; angels Micael and Gabriel holding a cross in a circle on the vault. The building dates back to pre-iconoclastic period. The depiction of Jesus holding a book in one hand and blessing people within a red frame on the Abscissa of the south chapel (10th century) that has one single nave, semi-circular vault and platforms for sitting on the right side of the entrance is quite interesting. There are also tunnels, a mill, a mosque, and some settlements other than monasteries in Zelve Valley. 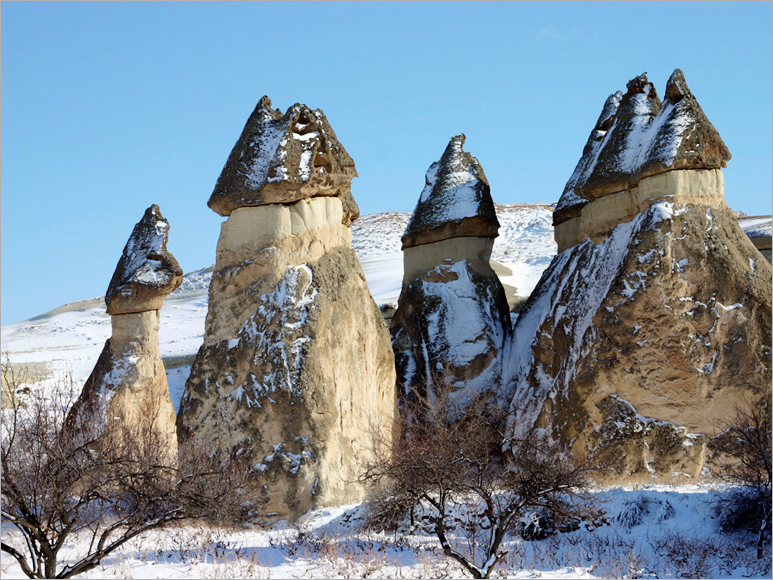 All kinds of fairy chimneys can be seen from the place currently named ‘Pashabagi’, which was once named ‘Kesisler Valley’ (meaning priests’ vineyard) located 1 km far from Goreme - Avanos route on the right. Chapels and hollows were carved inside some of the fairy chimneys with many main bodies and caps. The retreat cell for hermits that is reached at the end of chimneylike narrow steps and decorated with crosses, and the chapel built in the honour of Saint Simeon are situated in a fairy chimney that has three caps. The cell has an oven, space for living and sleeping beside a narrow window inside. Saint Simeon pursued a solitary life around Aleppo in the 5th century. However, later he escaped from the people’s excessive demands due to his miracles, lived on columns at 2 m and 15 m height. 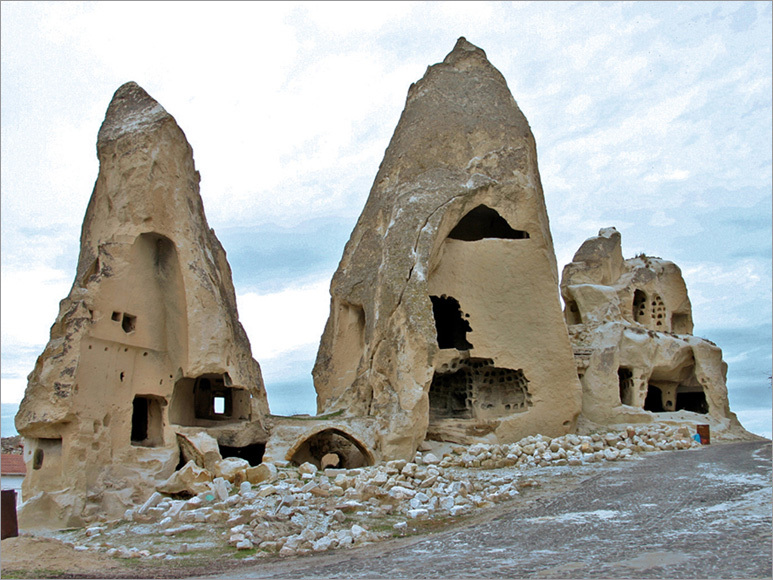 Monks in Capadoccia, too, lived in rooms at 10-15 meters height carved into the fairy chimneys. Lying on rock beds, they avoided worldly matters. 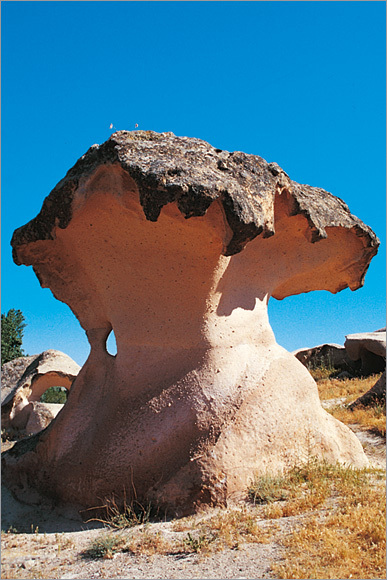 Ozkonak Underground City, located 14 km far from Avanos, was built on an area with thick layers of tufa. There are destroyed settlements established on the slopes facing the stream running in the city whose cleared parts are opened to visit. Settlements are carved along both sides of the three streams. Among the 14 venues with ranging sizes can animalhousing, kitchen, pantry and living rooms be mentioned. There are galleries expanding over wide spaces connected through channels to each other in the city. Also there are narrow and long holes used for communication between floors. When entrances to the rooms were closed, these holes of 5 cm depth were used for ventilation. Some holes were dug on the tunnel to be used for spilling frying oil onto the enemies. One can go downstairs by four floors through complex tunnels from eight floors of Kaymakli Underground City, which is established under the Kaymakli Castle located in 20 km south of Nevsehir. Animalhousing (on the first flor), church (second floor), wine warehouses, cisterns, kitchen and pantries (third floor), rooms, living rooms, ventilation chimneys, around one hundred tunnels connected with narrow corridors to each other and big round bolt stones that close the spaces between floors are all available in the underground cities equipped with facilities required for residing. Grape juice stores, food stores and earthenware jars on the fourth floor indicate that people having lived there engaged in economic activities and lived in relative prosperity. 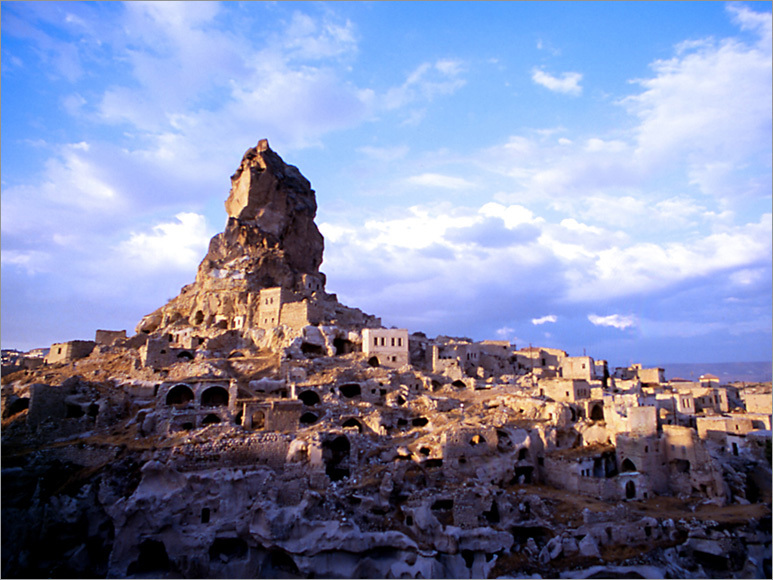 Derinkuyu Underground City is located within the borders of Derinkuyu county on the 30th km of Nevsehir- Nigde highway. The underground city has eight floors that are 40 meters deep with the required capacity to satisfy a crowded group’s needs of residing and living. Taking into account the well on the 7th floor, the depth increases to 85 meters. 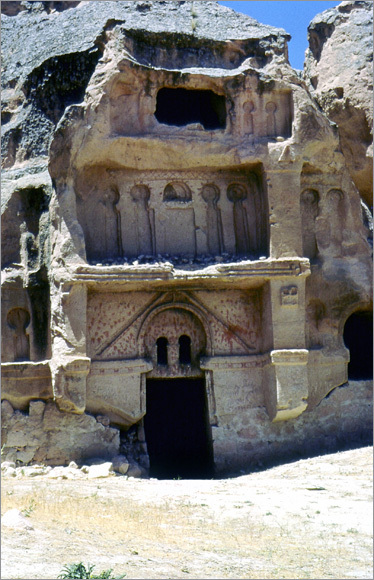 Unlike Kaymakli Underground City, Derinkuyu City has a missionary school, confession room and a baptism pool in it. On the 1st floor is an animalhousing, a simple grape juice plant and missionary school covered by semi-circular vault located. There is a kitchen, tandoor, deeply carved niches for kitchen tools and winehouse on the 2nd floor. As for the 3rd floor; food stores and the tunnel leading to the well can be seen. Rooms and stores are situated on the 4th floor. A ventilation chimney is inserted on the 5th floor; a church with cross plan sheme and the well positioned on the 7th floor which has a wide space and is supported by three columns. Lastly, a small room and a ventilation chimney are available on the 8th floor. Mazi Underground City carved on the steep slope of Mazi Village (whose ancient name is Mataza), situated in the south 18 km far from Urgup has 4 entrances. Main entrance is led through a corridor formed of uneven stones. The big bolt stone in the corridor was used to keep the entrance under control. Across the entrance are columns and animalhousings positioned. Between the animalhousings are the grape juice plant and the church decorated with relieves at the end of the corridor. Next to the entrance is a room for religious person positioned. One can see the well with depth of 20 m in the church, and a chimney also used as a hidden passage on the Abscissa. Some parts of Tatlarin Underground City, expanded over vast fields 10 km away from Acigol county, were cleaned. Two floors of the city that is thought to have been used as a military garrison and monastery due to its vast area, high number of food stores and churches are open to visit. A prison, pantry and kitchen on the right side beside the toilet are located on the 1st floor. Toiltes built in L shape in order to avoid unwanted scent can be seen in only this underground city and in the settlement in Guzelyurt. The building complex constructed for Damat Ibrahim Pahsa of Nevsehir in the 18th century is composed of a mosque, madrasah, library, children’ school, kitchen soup and public bath. Having a simple outlook but characteristics of the Tulip Period inside, Kursunlu Mosque (1726) has drawings on walls and ceilings done in a traditional Islamic style is positioned in the northeast of the complex. The Mosque has a courtyard with three gates and a neat minaret of 44 m height. The main room of the mosque is sheltered by the dome (16.65 meters of diameter) covered with lead. The inner parts of the mosque are decorated with figures of flowers. Within the complex in the west of the mosque, is the madrasah designed on a rectangular plan scheme situated. The courtyard is sorrounded with porticos having domes. In the northeast tower is the madrasah classroom positioned. It is possible to reach hand-written boks in Ottoman, Arabic and Persian languages in the library. The public bath in the north of the complex is made of hewn stones and sheltered under the dome. Beylik Han is positioned in the lower side of the Kursunlu Mosque courtyard. 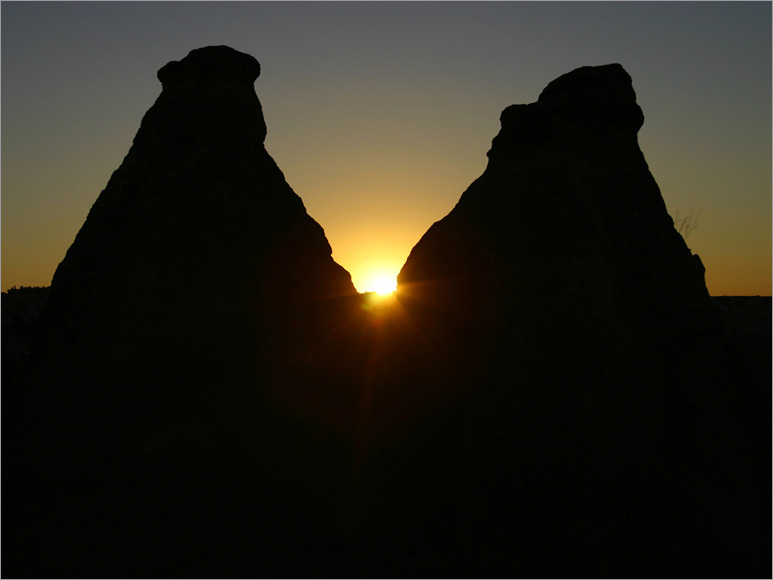 Some parts of the Han is formed as a result of carved rocks. Located in Damsa Village, 18 km far from Urgup in the southwest, Taskinpasa Building Complex is one of the leading architectural pieces built during the Karamanogullari Period. The mosque with three naves and sheltered by eleven vaults in the courtyard has a crowned gate decorated with geometrical ornamentations. Bases of the columns made of hewn stone, in the mosque exhibit flora figures and a style of ornamentation used by Seljuks and Ottomans on them. Inlaying technique was applied to the wooden niche indicating the direction of Mecca. The niche is on exhibition in Etnography Museum now. The octagonal tomb inserted on the square base in the east of the mosque was constructed in 1342. Embalmed part of the hexagonal tomb in the north of the mosque is blocked with building materials. The Seljukian style portal of the madrasah with 22.60 x 23.85 m, niche indicating Mecca, doors and windows are built using even hewn stones; walls are built using debris. The building complex in Gulsehir town was built for Vizier Silahtar Seyyid Mehmet Pahsa in 1777. It is composed of mosque, madrasah and fountain. The turbeh has a facade composed of an iwan with three adjacent archs. Pir House is entered through the gate with two wings and iron bars below the big arch in the center. 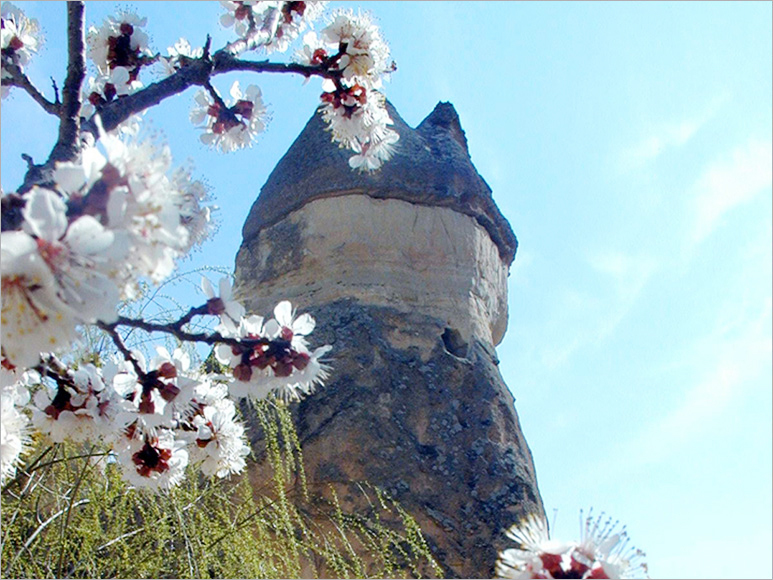 Sari Han is situated in Damsa Valley, which is 5 km far from Avanos in the southeast. It was built in 1249. The han is built using yellow, orange and light brown even hewn stones on an area of 2000 square meter. Stones with two different colors on the monumental external and internal portal of the building present a decorative and aesthetic view. The small mosque (mescit) with mucarnas tromps is located above the vault at the entrance. There is an iwan with fountain leading to the courtyard, and a bath in the right corner of the courtyard. The han restored properly in 1991 is the last building designed on the classical plan scheme of sultan hans. 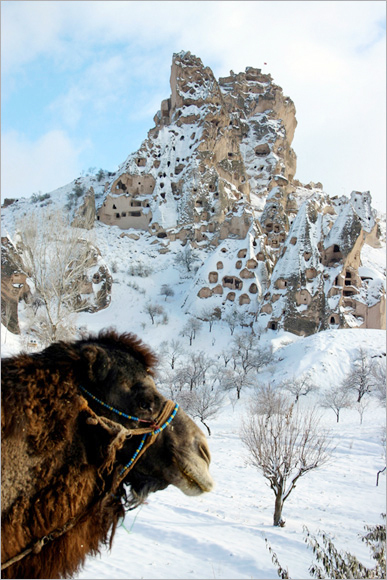 Built to defend the carwan route to Baghdad during Seljukian times, Nevsehir Castle is positioned on a sound basalt hill in the old settlement units in Nevsehir. The castle designed with a hexagonal plan scheme has 42 loopholes, 4 towers, and two gates one in the front and the other in the rear. Entrance gate to the castle is in the southwest. The castle was rehabilitated by Damat Ibrahim Pahsa during Ottoman times and restored again after the proclamation of the Republic. 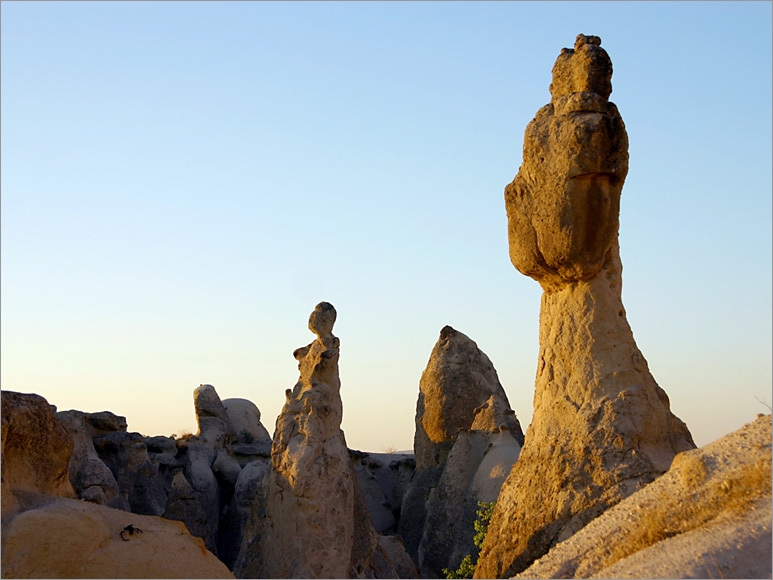 Uchisar, which resembles a castle due to its natural view, is positioned 10 km from Nevsehir town. 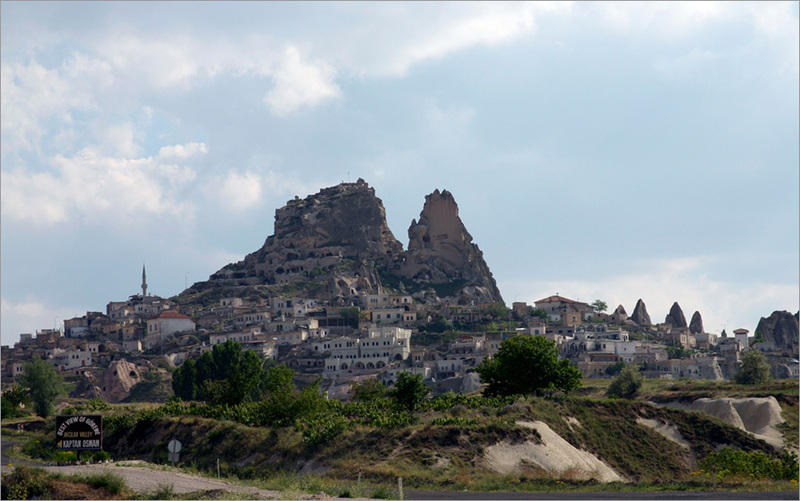 The castle built against attacks of Arabian armies by Byzantines; also present a wide picture of Capadoccia. An old cave carved in the castle can be reached through three routes, all of which are combined in a single wide room. Rooms in the castle can be reached by means of steps, tunnels and corridors. Bolt stones are located at the entrance of rooms in order to control entrance and exit. Some of the long and narrow corridors are already collapsed while some others are blocked with debris. 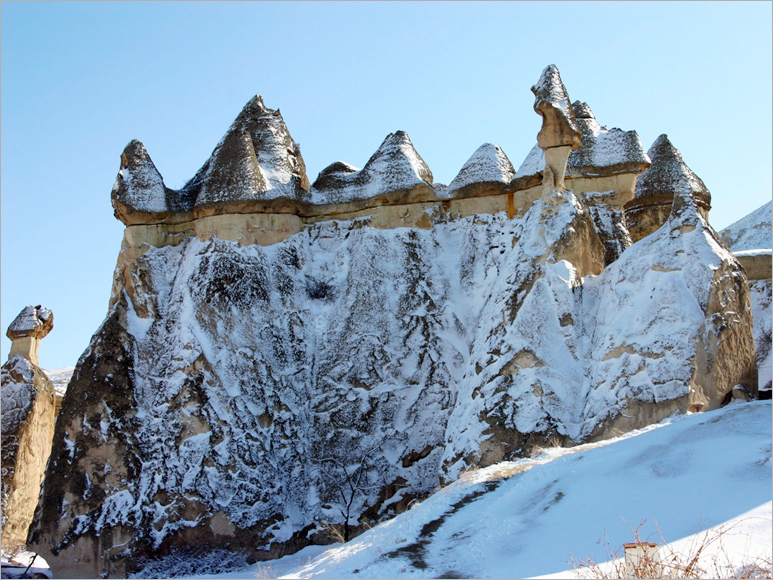 It presents the view of a natural castle surrounded with carved houses in the middle of Ortahisar located 6 km from Urgup in the south of Urgup- Nevsehir road. The rocks where the castle is located can be easily carved; so, even today citrus fruits are kept in the underground fridges carved naturally. Upper parts of the arched wooden gates of the houses built by carving or using hewn stones in the 19th century are rosetted and ornamented with figures of stylized ivy. There are many rooms, and other units like kitchen, pantry, store, tandoor in those settlements with casement and hung windows. The houses with regional architectural characteristics can be mostly met in Urgup, Ortahisar, Mustafapasha, Uchisar, Goreme and Avanos. Pigeons represent faith to family and peace in Islamic belief; and God’s spirit in Christianity. That’s why pigeon-houses are available in most of the valleys or upper parts of the fairy chimneys in order to utilize manure of them in agricultural activities. These small structures rarely dating back to the 18th, but mostly to the late 19th century and early 20th century are important in terms of representing Islamic art also. It is possible to see 3 - 4 adjacent holes or two lines of holes above each other on facades. On three sides of a room inside are there 4- 5 lines of niches for birds to rest and lay eggs. Even the smallest ones are large enough for more than one hundred pigeons. Outside facade of these structures are decorated various figures and brown or black color paintings on white color ground depicting daily life events. There are also pigeon-houses made of hewn stone. 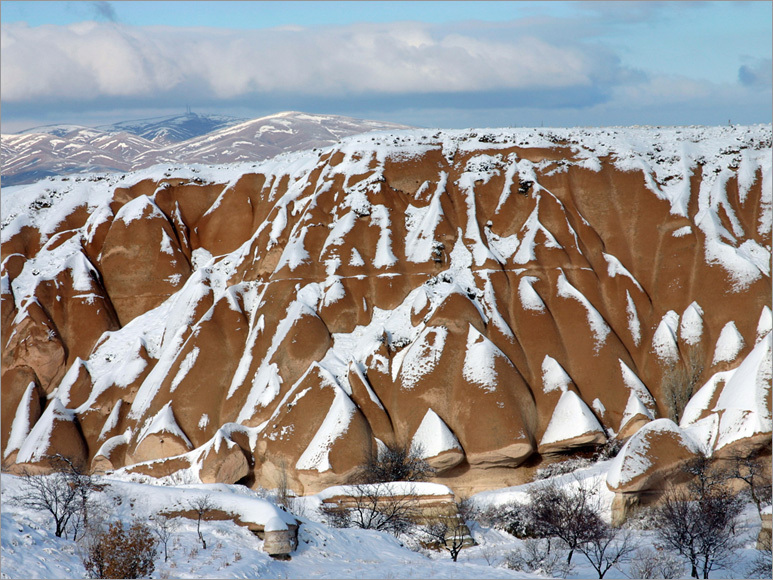 The valleys around Uchisar, Goreme- Kiliclar and Gulludere Valleys, Urgup- Uzengi Valley, Ortahisar - Balkan Deresi and Kizilcukur Valley, Cat Valley around Nevsehir and Soganli Valley within Kayseri borders are places where pigeon-houses can be predominantly seen. It is said that thermal water in Kozakli County helps cure various diseases such as nerve and muscle tiredness, rheumatism, respiratory track disorder, neural diseases, gynecological disorders, and interarticular cartilage calcinosis. Thermal spring and spring resort water in Urgup is salty, immune from scent and acid at the temperature of 14 degrees. Sulfurous mood and bath are beneficial to treat dermathological disorders. Water containing gas and bicarbonat but immune from any scent at 18 degrees is available in the spring resort in Bahceli Village. It helps digestion systme and kidneys; also it can be consumed as drinking water. Gumuskent (Salanda) Spring Resort provides earth-based mineral water containing bicarbonat and carbondioxide. It helps overcome disfunctions like liver and gallbladder failure. Another spring resort on the way to Avanos is Corak Spring Resort with the known positive effect on digestion. Karakaya Spring Resort, located on the sama route, is known effective in treating diseases in stomach and intestines. The water released in Sarikaya Spring Resort located 8 km away from Nevsehir town is salty with sodium bicarbonat. It is known to cure disorders in stomach and intestines. Also the spring resort on two sides of Uzengi Stream in the south of Urgup (3 km) is the source of water containing gas and bicarbonat but immune from any scent. It helps cure digestion failures and kidney dysfunction. 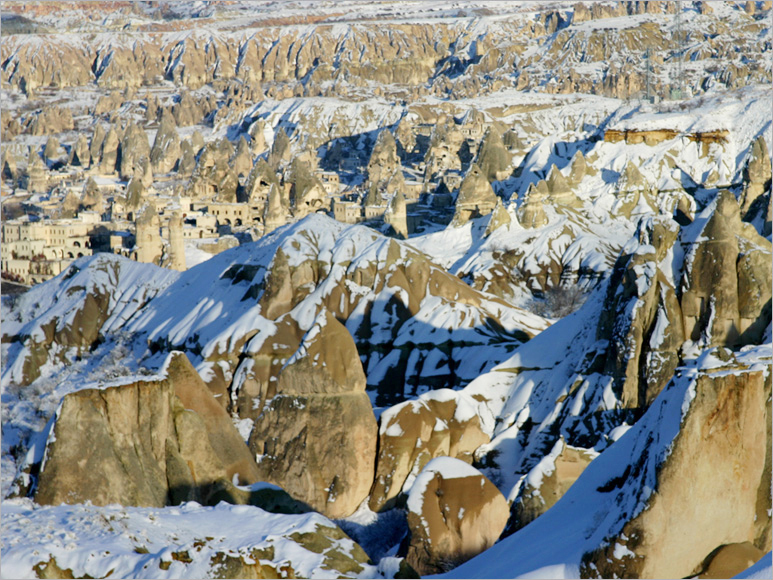 There are some roues for natural and cultural reasons in Goreme National Park and its surrounding. Horse-riding in the nature, safari on bikes and jeeps; racket tours during winter time are among facilities available in Capadocia, Land of Lovely Horses. 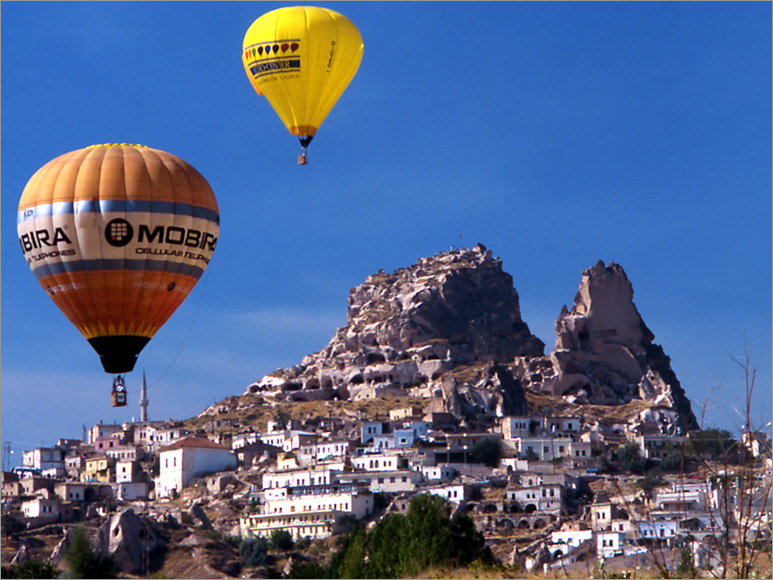 Paragliding in Uchisar and Goreme is preferrable to see the beauty of the region from a different view. 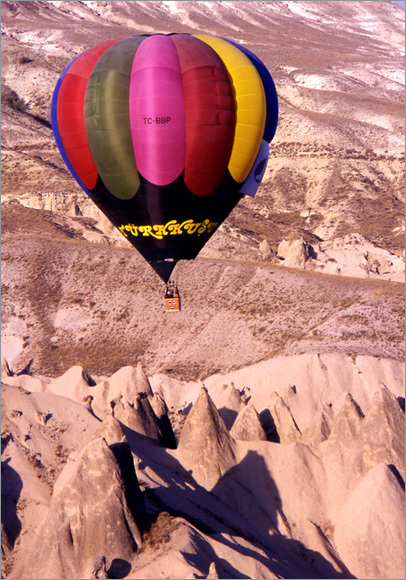 Also balloon tours present interesting experiences for viewing natural beauty at a wide scale. 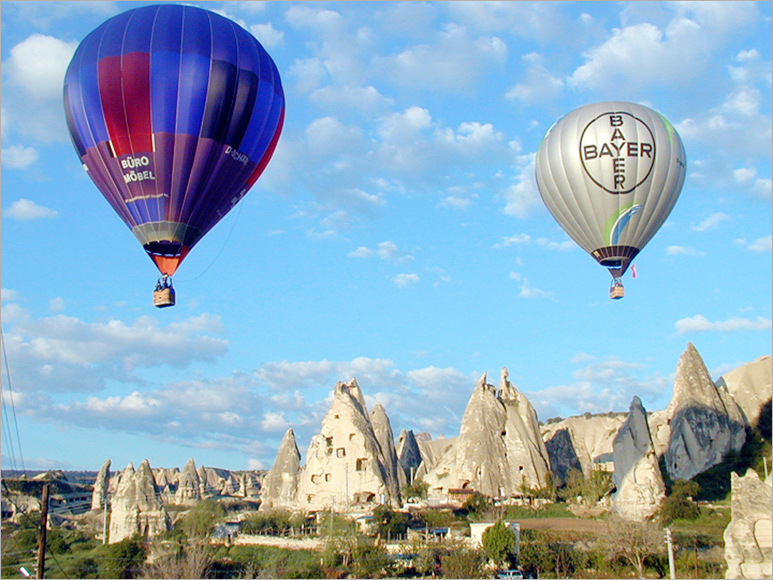 One can see the magnificent landscape in a balloon tour in the very early morning. Regional cuisine is worth tasting: kebap in earthenware of Avanos, zucchini sweet of Acigol, wine and molasses produced with the regional grapes can be mentioned as the best known kinds of food. Other kinds of food or cuisine are as follows: tarhana, düğün, kesme, sütlü ve patates çorbaları, ağpakla, soğanlama, dıvıl, cacık, ayva dolması, çanak, Nevsehir tavası, zerdi pilavı, sızgıt, kömbe, kışlık ekmek ve tatlılardan da bulama, aşure, irmik tatlısı, dalaz, aside, hoşaf . In addition, it is worth buying and tasting high-quality wine of the high-quality grapes in the region. Striped carpet weaving is performed in Avanos and Urgup, where weaving industry is developed. Again Avanos is famed with pottery making performed for centuries. Pots produced in the stores, leather material, carpets, onyx vases and curios, and authentic dolls made of fabric can be mentioned as material peculiar to the region and that can be bought as souvenirs.